We’d love your help. 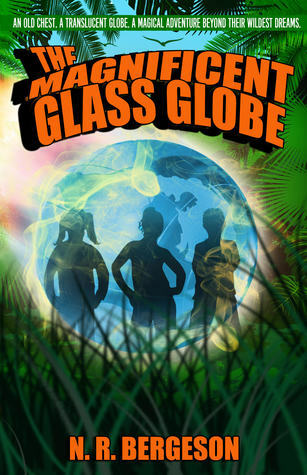 Let us know what’s wrong with this preview of The Magnificent Glass Globe by N.R. Bergeson. One day, while mischievously exploring the museum’s warehouse with her brother Ike and best friend Helen, Mary stumbles across an old travel trunk belonging to her grandfather. Inside, they discover an nondes Eleven-year-old Mary Tucker dreams of visiting the Amazon. But if her father, a museum curator, has his way, she might be a grandmother before she ever gets the chance. The magnificent globe lets the friends zoom closer and closer toward the earth’s surface, eventually bringing them close enough to touch the trees. That's when the globe entirely disappears, and they find themselves falling. To ask other readers questions about The Magnificent Glass Globe, please sign up. This is my first time to read a Nils Bergeson book. This has been an amazing adventure to the Amazon jungle. As real as it can get, I was transported to Columbia and got lost in the Amazon rain forest with the Mary, Ike and Helen without having to leave my room. The Magnificent Glass Globe is one magical way to travel anywhere in the world in just one touch. Now, I know of two ways to go on adventures around the world without having to go on planes and immigration checks. Mary Tucker has an obse This is my first time to read a Nils Bergeson book. This has been an amazing adventure to the Amazon jungle. As real as it can get, I was transported to Columbia and got lost in the Amazon rain forest with the Mary, Ike and Helen without having to leave my room. The Magnificent Glass Globe is one magical way to travel anywhere in the world in just one touch. Now, I know of two ways to go on adventures around the world without having to go on planes and immigration checks. Mary Tucker has an obsession with the rain forest and the Amazon. Well, more like everything green or with leaves. I think she has a soul that was born to fight for conservation of nature. A literal tree hugger. And she often fantasizes about going to the Amazon. Running carefree under the canopies, jumping over fallen logs and feeling the fallen leaves under her feet. It is Mary's greatest wish to travel to the Amazon and watch the Amazon river wind its way to the Pacific Ocean, but there are two problems. One, she is only 11 years old. Second, her father would not allow it. Maybe, when she is older and she can afford it herself but for now, she has to content herself with traveling and seeking adventures inside the museum where her father is the curator. Until one fine day... it all came true. I love this book. The events were fast-paced and packed into one story yet not too long or too short. It surprisingly did not miss any significant detail. The chapters flowed smoothly from one to the next and still maintain the same amount of excitement and anticipation. It felt like I was right there with the three kids with all the vivid and clear descriptions of the surroundings. The narrative has a way of including me into the adventure and experiencing it for myself. I love to travel but I honestly did not ever envision myself going to the Amazon. The Iguazu Falls, the Maya pyramids and Machu Pichu maybe, but not the Amazon, itself. But after reading this book, it made me want to experience the jungle and see the famous river for myself, not even considering and worrying about the dangers of such expedition. One thing that struck me about the story was the fact about pink dolphins in the Amazon River. I have seen pink dolphins in Underwater World Singapore in Sentosa Island way back in 2008. I was so mesmerized by this creatures that I bought myself a stuffed toy as a souvenir of that wonderful experience. But I never imagined that these dolphins are swimming in the Amazon too. It was a surprising and amazing fact. It's one great testament to how great this river is and what other unique and exotic creatures live in its depth. According to the biologist in Underwater World Singapore, pink dolphins are actually adult dolphins. They shed their skin as they grow old but when they were younger they have the same color as the other dolphins. But not all dolphins shed their skin and become pink. Pink dolphins are one of a kind as they are only found in fresh water rivers. This story has amplified and magnified my love to travel either by being physical there in the location or by traveling through books that take me to exotic locales that are way beyond my reach, budget and logistics. I have not been able to do a lot of out-of-town and out of country trips this past year due to my lack of funds. This story has just reminded me that my first love would always be to explore and experience something new. I will never grow tired or grow old of it. This just made me want to fiercely and crave more to go out of my comfort zone and embrace the world. For now, I will just have to content myself with staying put and let my mind and imagination do the traveling for me. But I know it won't be long, my feet will soon touch on those sacred grounds and follow on the footsteps of those great culture and civilization that came before me. Real soon. I give this book 5/5 pink dolphins. I never thought that this story would lure me to want to explore and be dazzled by the magic of the Amazon. The obsession of Mary has rubbed off on me, not that I too am obsessed with the urge to get there very soon but the hint of unimaginable possibilities of being in its embrace has captivated me. Yes, after this book, I will add traveling to the Amazon to one of my bucket list. I am looking forward to the next adventures of the Tuckers and Washington Explorers. Where could their next adventure lead? I definitely can't miss it! Congratulatuons N. R. Bergeson! This is one amazing story and adventures kids of all ages would love. I am hoping to have more adventures with the characters that would take me out of my comfort zone. Life is always better when seeking adventures. Well, as the author, I suppose my opinion of the book doesn't count. But I certainly had a wonderful time writing this one, and I hope it proves to be the first of many adventures we can go on together. Thanks for reading! NR Bergeson reminded me that we do not have to go to a distant far away fantasy world to find magic. There is plenty of magic around us in our every day world. Our imaginations, and the natural wonders around us are filled with magic if we only take the time to appreciate it. I highly recommend this story to any and all readers, especially those who take the time to appreciate the natural magic of our wondrous earth. What a great book! Perfect for mid/upper elementary school readers, I found that even as an adult I enjoyed it! Each chapter propels you to the next, immersing you in the adventure. As a mother of three girls, I particularly love that there is a strong, intelligent leading female character. This is a well written book for young adults. I was asked to review by Librarything.com. I loved this book, magical and mysterious – a child who wants to see the amazon, a globe connected to the family. I loved the fact that I too felt I was transported with this amazing globe and sat by the fire visualising this. There was an eco-side to this with the Amazon forest with the reader being informed about the plight of the forests although some reviewers thought this may be a bit too heavy but young This is a well written book for young adults. I was asked to review by Librarything.com. I loved this book, magical and mysterious – a child who wants to see the amazon, a globe connected to the family. There was an eco-side to this with the Amazon forest with the reader being informed about the plight of the forests although some reviewers thought this may be a bit too heavy but young people need to know these facts and as this was part of this story this is a great way to inform people. Recommended read due to be published April 2017. The Magnificent Glass Globe is a delightful book about the magic of travel. Although the main character, Mary, travels instantly with a magic globe, the real magic lies in the people she meets, the animals she helps, and the beauty of the world around us. And that magic is available to us all. I admired Mary's ambition to see the remote parts of the world. She has a great imagination, but she's growing up and wants to see the real world instead of just imagining it. I really liked Mary. She has a The Magnificent Glass Globe is a delightful book about the magic of travel. Although the main character, Mary, travels instantly with a magic globe, the real magic lies in the people she meets, the animals she helps, and the beauty of the world around us. And that magic is available to us all. I admired Mary's ambition to see the remote parts of the world. She has a great imagination, but she's growing up and wants to see the real world instead of just imagining it. I really liked Mary. She has a determination to get what she wants. Her love for animals reminded me of Steve Irwin. Or perhaps Hagrid. The respect and care she has is for all animals, especially the ones that would have me running and screaming in the opposite direction. Mary finds a magic globe that takes her, her brother, and her friend on an adventure in the Amazon. Ironically, the first thing they want to do when they get there is go home. I actually really related to that. When I went to Europe a few years ago, it was such a long and tiring trip and everything was new that I had the same thought of going home right when we got there. Which seems crazy, right? But I thought it was very realistic. And like Mary and her friends, I got over my initial fear. These kids have to survive alone in the Amazon but instead of being terrifying, it was realistic and pretty funny. I hope this book inspires kids to go see the world. I loved how real and vibrant the Amazon felt. I could tell the author had actually been to the actual locations in the book. When I looked up Puerto Narino, it looked just like I thought it would from reading about it in the book. This adventure is also a heartfelt story about family. It's funny and inspiring and I can't wait for the next one. We live in a wonderful world, and it's just waiting for us to get out and see it. 11-year-old Mary has always wanted to visit the Amazon. Until one day when she finds a mysterious globe, her dream finally comes true. With her brother Ike and her friend Helen, she explores the wondrous Amazon and does what she can to find a way home. Before that, they have to face a very angry, unwelcome visitor. This story takes the readers into the wondrous Amazon following the adventure of three courageous children with kind-hearted Amazonians and mysterious guardians. Written in a flowing s 11-year-old Mary has always wanted to visit the Amazon. Until one day when she finds a mysterious globe, her dream finally comes true. With her brother Ike and her friend Helen, she explores the wondrous Amazon and does what she can to find a way home. Before that, they have to face a very angry, unwelcome visitor. This story takes the readers into the wondrous Amazon following the adventure of three courageous children with kind-hearted Amazonians and mysterious guardians. Written in a flowing style, with enough descriptions, well-built main characters, and just the right pacing, this story is easy to follow and appealing, inviting the readers to keep reading it to the last page. This is an original and very enjoyable story, especially for middle grade readers. N. R. Bergeson is the author of the “Glass Globe” series of children’s novels, a former U.S. Diplomat, and a passionate proponent of global education. N. R. (Nils) Bergeson has lived all over the world - in Russia, Romania, Colombia, Kazakhstan, Afghanistan, and Indonesia. He has traveled to more than 65 countries with his wife, Emily, and their three young children. They now live in northern Utah. N. R. Bergeson is the author of the “Glass Globe” series of children’s novels, a former U.S. Diplomat, and a passionate proponent of global education. N. R. (Nils) Bergeson has lived all over the world - in Russia, Romania, Colombia, Kazakhstan, Afghanistan, and Indonesia. He has traveled to more than 65 countries with his wife, Emily, and their three young children. They now live in northern Utah.